Please alter your security settings. Click here to see how. A large yard gives you the freedom for games and an approved dog. 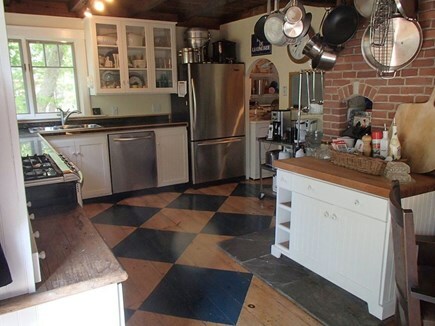 Enjoy a Vineyard meal in a well appointed kitchen. Combined area for easy entertaining. Reading and relaxing space off the main area. 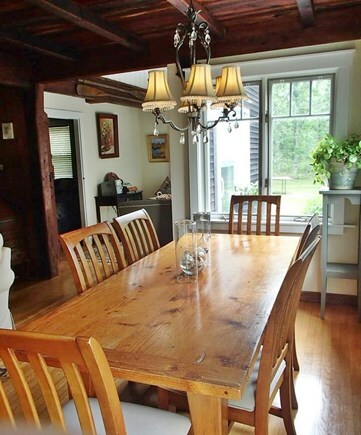 Dining table for a roomy six. A classic and well appointed Vineyard kitchen. 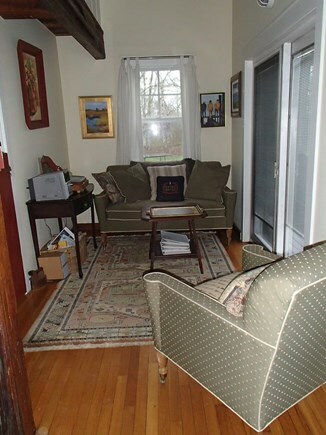 Sitting area off of the main area. Master Bedroom first floor bedroom to listen to the waves. 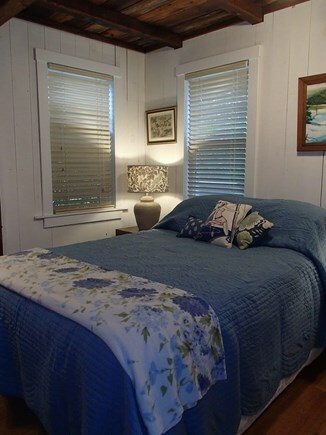 Master bedroom second floor, listen to the waves sail into sleep. 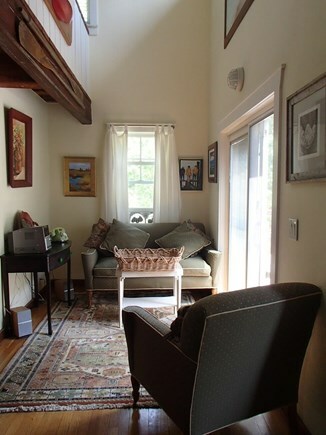 An upstairs den offers privacy and a futon for extra guests. Everyone's favorite, the outdoor shower. State and local taxes of 9.7% will apply. Artisan home with Large yard. Dog considered. The Perfect Family Getaway: This luxurious home is ideal for your family getaway! 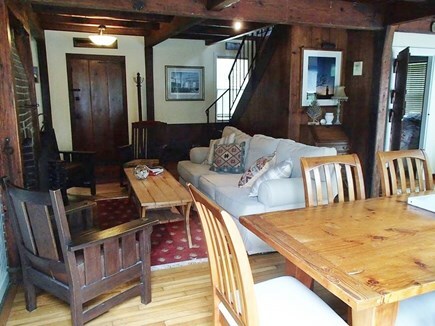 It is conveniently located to Edgartown Village, beaches and steps to the bike path. The home is nestled in a forest where your family and guests can enjoy the privacy the Vineyard is known for with excellent access to towns and beaches. 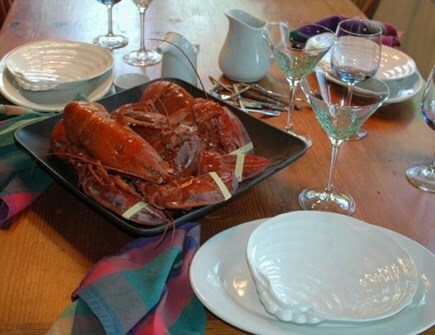 We are approximately equal distance to Edgartown, Vineyard Haven, Oak Bluffs, and West Tisbury. We are located outside of the village of Edgartown in a private area where all homes have 3 to 11 acres of land. This home offers tremendous privacy and tranquility. You can escape the hustle and bustle and still be minutes from beaches and 4 miles from Edgartown Center. Bike, rollerblading or running are steps away as we are directly across the street from the bike path. Unbeatable Outdoor Living Space: This home can't be beat for outdoor living! An expansive outdoor deck offers the perfect venue for outdoor dining, reading a book in an adirondack chair, sharing a drink after a day at the beach, or relaxing in the six person hot tub, in a spacious and landscaped yard. 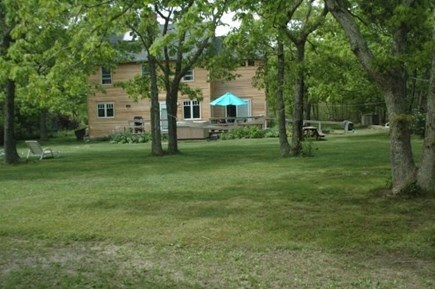 This property is across from 100’s of acres of conservation land and it is not unusual to see deer and other wildlife. Because there are no surrounding lights the sky is illuminated at night by the stars. This home features top-notch details throughout. The glass surround main level gives the sense of indoor/outdoor living. 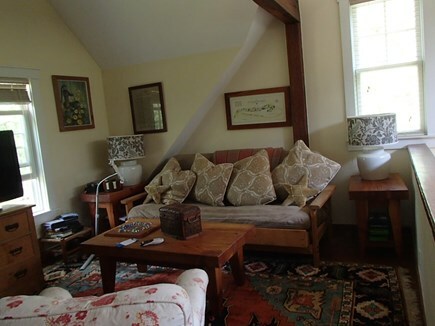 Professionally decorated, this home will make your Vineyard visit a trip to remember. The chef’s kitchen is very well-equipped with high quality stainless steel appliances. 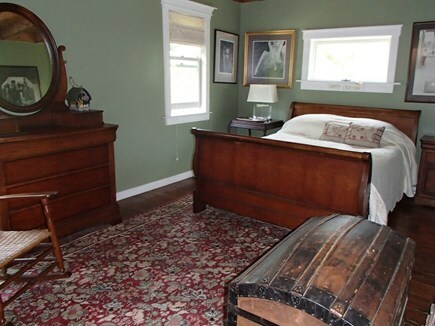 The main level, has one, of the two master bedrooms with a queen sized bed. The main floor bath include a large spa shower with 5 water heads, and room for two. The upper level has the second Master bedroom with a queen bed. The coastal themed bathroom with an open air skylight, brings the Vineyard in. Also in this level, the entertainment center, which including a 40 inch Television, games and videos, in addition to satellite television. A futon with a privacy drape for overflow sleeping and comfortable seating to curl up with a book. 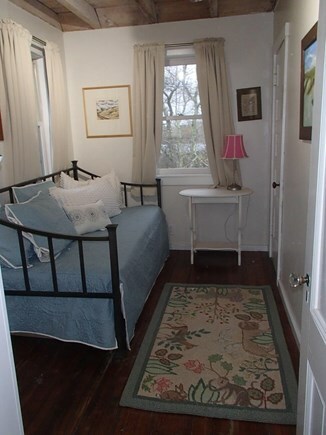 An third intimate bedroom, has a trundle beds for the young or young at heart. This 3+ bedroom, 2 bath home stands out from all the rest. Additional availability info: Refundable security deposit-350.00 Additional taxes to be applied. This is a Sunday to Sunday vacation rental. Additional pricing info: $ 150.00 cleaning fee per week, State and local taxes of 9.7% will apply. We have a handicap ramp directly at the parking area to access the first floor. Doorways have low thresholds. This property does not currently have any guest reviews. We're so blessed to live on this fantastic island year round. My husband Don and I have been married since 1988. We create Art. I'm a a painter of Oil and Pastel and he is a fine furniture builder. You'll see our work in galleries around the island, and of course in our home. In addition to art, I'm a special needs teacher, Don caretakes island properties when he's not golfing. We are fun easy going people who love life, people and joy. We all can all chose to be happy. What is special about this property? We are across from a FREE state park for biking and hiking. Miles upon miles of bike paths to enjoy. Our highly desirable central location, we are centrally located to access beaches, and island activities. We are 4-5 miles outside of town shopping district. We have equal access to up or down island beaches. Our driveway is around .25 of a mile, so it's safe (traffic) for dogs and kids to play and just so serene. Literally across the street from the driveway is the bike path. Even in high season, we're not gridlocked in traffic, we never need to worry about where to put a few cars, as we have a large parking area. We appoint the home as we would want to have as a tenant and we were renters for 10 years. Well appointed kitchen, lush linens and towels, comfortable seating. Anything you can think of in kitchenware. We have old growth beautiful gardens and lots of little areas to relax. 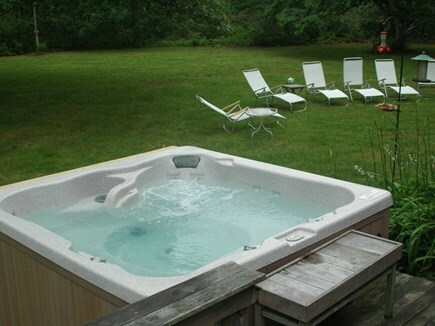 And of course-the hot tub! We are located just over a mile to enter one of the Vineyards finest beaches. What is special about your town? Martha's Vineyard is paradise! Its' light, terrain, beaches, amazing. Describe yourself, what you're looking for, and ask questions! Not from the United States? you want to log out?